Among the countless Nature wonders, one of my favourites is the almond blossom. A winter beauty of white petals turning into tender drop protected by a green velvet shell becoming finally delicious and nutritious nut with a main role in Spanish gastronomy, specially in Anadalucia. So, once the miracle occurs, we get inevitably to the meatballs in almond sauce. This is another traditional recipe of Malaga based on a “majadillo”, pestle and mortar (or eletric blender) in hand to mash garlic, bread and almonds. Adding very little more we get a wonderful sauce absolutely simple and yummy. For our cooking class we use sometimes a tajine to prepare this dish so similar to Moroccan koftas. Almond sauce: 1 cup water (or chicken stock), ½ cup dry white wine, 2 whole garlic cloves peeled, 1 slice country bread (better if 1 or 2 days old, crust removed), 15 almonds blanched and peeled, 1 bay leave, turmeric (or saffron threads), salt, black pepper and extra virginextra olive oil. PREPARATION: Use a large bowl to season the meat with all the ingredients, working with your hands until they are well incorporated. Let the paste refrigerate for at least 1/2 hour. 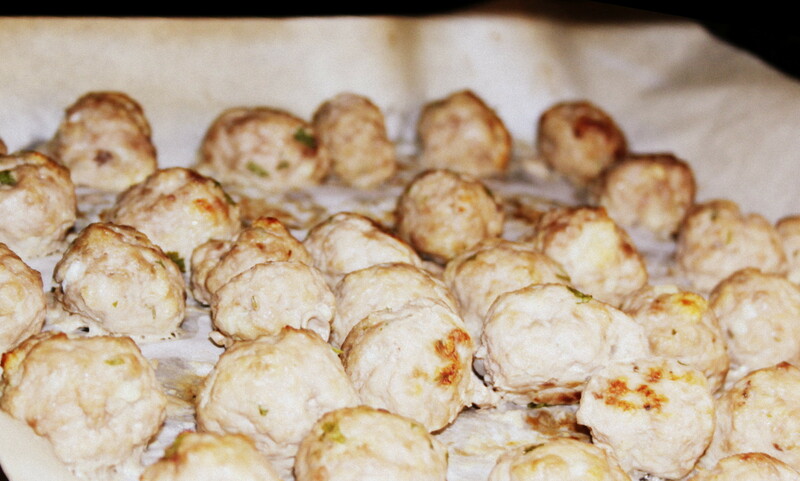 Preheat the oven at 180-200ºC and shape the meat into one-bite-size balls. Place them over the oven tray covered with a baking sheet and bake them for about 10-15 minutes. Don’t over bake them, they will cook further in the sauce. In the meantime prepare the sauce: cover the bottom of a saucepan with olive oil and fry the peeled almonds, bread and whole garlic cloves until golden brown (not burnt!). Remove and transfer to a blender vase. Add the water or stock and blend (this mix, without the water, is called “majadillo”). Heat again the pot with the remaining oil (add some more if necessary) and place the meatballs along with the blend, 1 bay leave, 1 clove, the white wine, turmeric, salt and black pepper. Stir carefully, cover and let it simmer over low heat until the sauce gets a thicker consistency, stirring carefully several times and add some more liquid if getting too thick (bread is a powerful thickener). Serve hot with boiled rice, fries or a good slice of Spanish omelette!